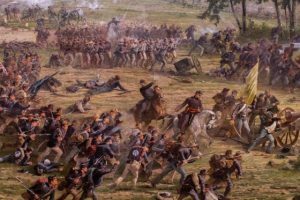 One of the most popular dioramas that are built around the world represents Pickett’s Charge in the American Civil War. The charge itself involved 12,500 infantry of the Confederacy in South who were trying to overrun the Union North at the battle of Gettysburg. The charge resulted in a 50% casualty rate for General Robert E. Lee’s Confederates. They never recovered and the Union went on to win the war. While the battle was mainly fought by the infantry, the Generals on horseback were a sight to behold. One of my favourite models features General Lee and General Longstreet from the Confederacy. While the South’s soldiers were generally clad in anything that resembled grey, the Generals were a totally different affair. The model in question, which is housed at the Gettysburg Museum in Pensylvania, is centered around the two generals having an informal chat while watering their horses. Although Generals oversaw the battle from the back of the lines, they still carried full military weaponry consisting of scabbard and sword and pistols. General Lee’s expressions are very lifelike in this model and seem to reflect the confidence he had that the Confederates were going to win the day against General Meade’s Union troops. He has one leg resting on a log and his hands on his hips with his chest puffed out in apparent pride. He is down to his waistcoat and has a pipe in hand. General Longstreet is leading his horse by the reins and cuts a more serious figure in his braided jacket and hat. A lot of customisations were made to this model to achieve the likeness of the two men and the fact that the model is in 1/12 scale makes it even more impressive. The paint job is done with oil paint, one of the hardest techniques to master in the modelling world.